I had always dreamed of sailing far and wide, so after high school I joined the U.S. Navy and made four crossings of the Pacific on my way to and from Vietnam. Years later, during my professional career, hours in the office led to dreaming about adventure and world travel. I wanted to do something big and take on a great personal challenge. During the late 1990's my wife and I bought a motor yacht and cruised the Great Lakes for several years. As we neared retirement, we talked about those years as some of the best times of our lives. That's when we decided to resume boating, but this time we bought an ocean cruiser. I studied for my captain's license and learned everything I could about ocean cruising. We began by cruising the west coast with teaching captains, then with other boaters, and then on our own. Over several years we eventually cruised from Alaska to Newfoundland. We loved the challenges and adventure. That's when we decided to take up the challenge of crossing the wild Pacific. I wrote this book to share with my friends and family our adventure, and to help aspiring dreamers know something about how to go about doing it. Like marrying Rebecca, it was my dream come true! Crossing the Wild Pacific (Captain's Log of the Yacht Argo) by Robert R. Tisch is a non-fiction adventure book that would appeal most to a mixed audience of young adults and adults who are interested in learning about different cultures, different places, and being entertained with true maritime stories. This book follows Randy and Rebecca Tisch’s journey from Florida all the way to New Zealand on their private yacht. The journey is not just about getting to New Zealand, but about exploring the world along the way. The journey leads the couple to stop at many different places such as the Bahamas, Santa Marta, the Galapagos islands, Tikehau, and Bora Bora. Are you ready to see the world and its many different cultures through the eyes of Robert Tisch? 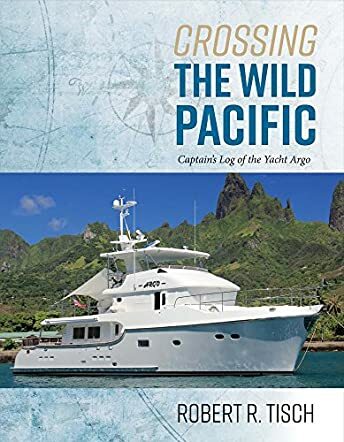 Crossing the Wild Pacific (Captain's Log of the Yacht Argo) by Robert R. Tisch is not just a well-written and informative book, but also an entertaining read. This is so much more useful and informative than internet articles and guidebooks for learning about places to vacation as it described so many different places around the world. I really liked how the book did not just describe these places, but also taught me about the cultures and the people who live there. The way that the author blended the story of the trip with information about the locations was simply genius as it allowed me to be both educated and entertained in equal measure. Overall, I greatly enjoyed reading this book and it has inspired me to try to take a trip outside of the United States for my next vacation!